As we grow older, our skin becomes drier and more fragile. According to Medscape, as many as 75% of older adults live with dry, flaky skin, which is not only easily damaged (bruised, scratched, or cut), but also often results in uncomfortable itching. The most prevalent areas for dry skin in older adults are the elbows, lower legs, and forearms. For seniors who are less mobile than they used to be, dry skin may also have a role in the development of pressure sores from remaining in one position too long in either the bed or a chair. Avoid hot showers and baths. Warm water is less drying to the skin. Encourage the senior to bathe less frequently if possible. While hygiene is important, utilizing “dry baths” (with a damp towel) may be sufficient between baths and showers. Use mild shampoos and soaps on the older adult’s skin. If his or her skin or scalp is especially dry, there are special products, such as Nizoral, that may help. Moisturize the senior’s skin well, particularly after bathing or showering. Use products that are unscented, as scented products may further irritate the skin. Make sure the senior drinks plenty of fluids. Consider using a humidifier in the winter or in dry climates. If the senior smokes, encourage him or her to stop. Incorporate stress-reducing activities into the senior’s daily routine. Be sure he or she uses sunscreen when going outside, and limit exposure to the sun. 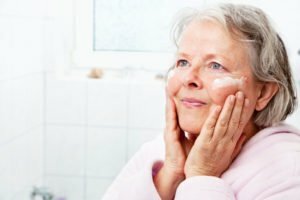 It’s a good idea to check your senior loved one’s skin on a regular basis to see if there are any signs of excessively dry skin, and seek medical care if needed. Serving Marin, Sonoma, Napa counties and the Tri-Valley, our trained staff at Hired Hands Homecare can provide hourly or live-in California senior care assistance, helping with bathing and dressing, and many other personal care tasks to help keep seniors safe and healthy at home. We also provide a full range of in-home assistance with light housework, cooking, running errands, providing transportation, companionship, and so much more. Contact us at (866) 940-4343 today to schedule an in-home assessment. We can help you and your loved one decide what level of care and services are best for his or her individual needs.